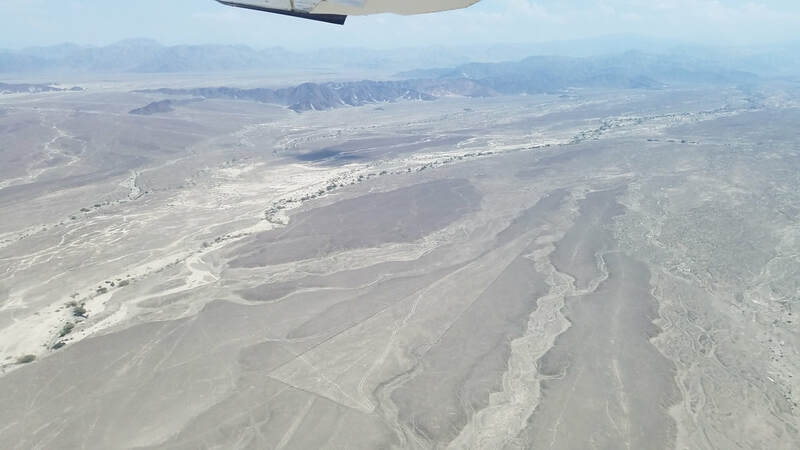 There are Things You can Only See from the Air – Perú’s Nazca Lines! Aircraft are great traveling machines but they are also fantastic platforms for sightseeing. 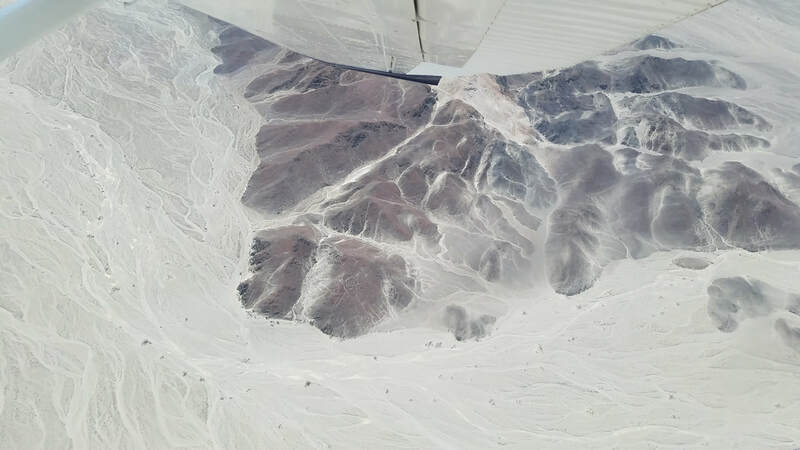 I recently found the best place for aerial sightseeing - the Nazca (often spelled “Nasca”) Lines in Perú! If you don’t take to the skies, you could miss them! 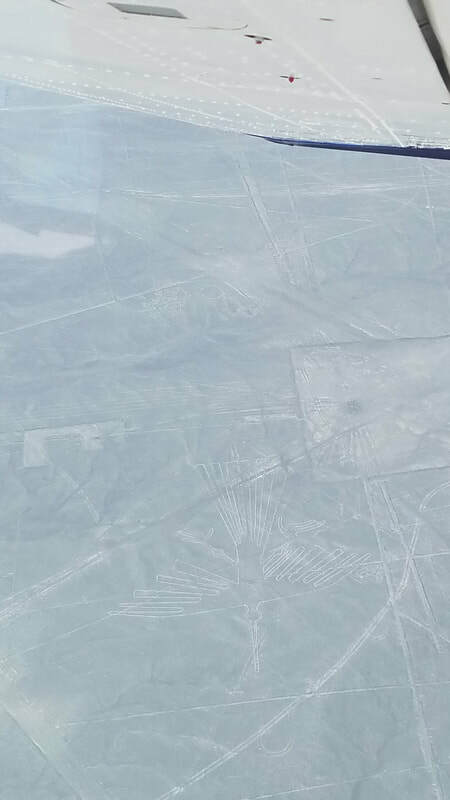 These geoglyphs can only be seen from above, partially because of their massive size. 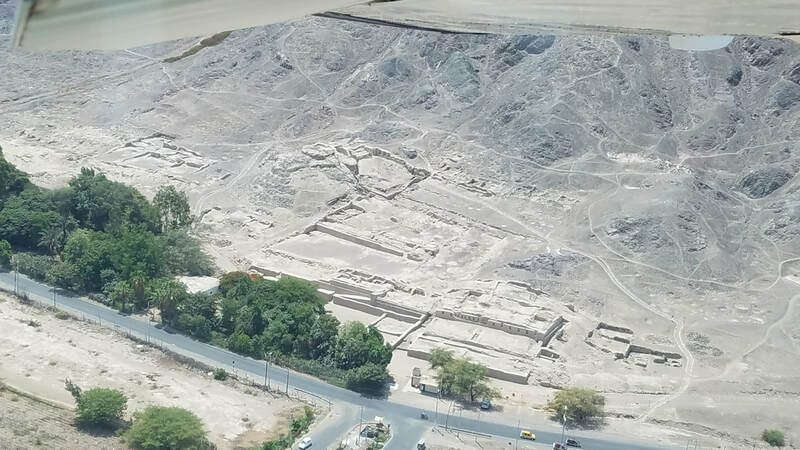 The town of Nazca is about 250 miles south of Lima, Perú’s capital. 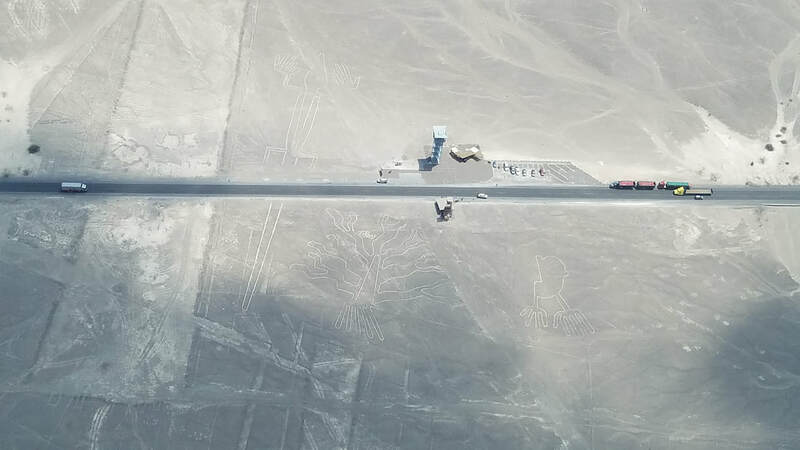 According to The History Channel (https://www.history.com/topics/south-america/nazca-lines), the Nazca Lines are a collection of giant geoglyphs (designs or motifs etched into the ground) created by the ancient Nazca culture (which began around 100 B.C. and flourished from A.D. 1 to 700). 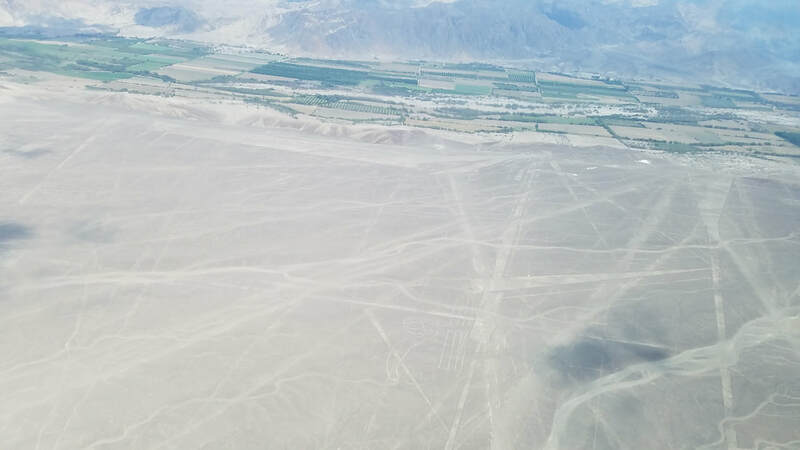 These lines (some of which are 30 miles long), geometric designs, and pictorial representations (some of which measure up to 1,200 feet) were designated a UNESCO World Heritage Site in 1994 and are still a mystery to researchers despite having been studied for over 80 years. 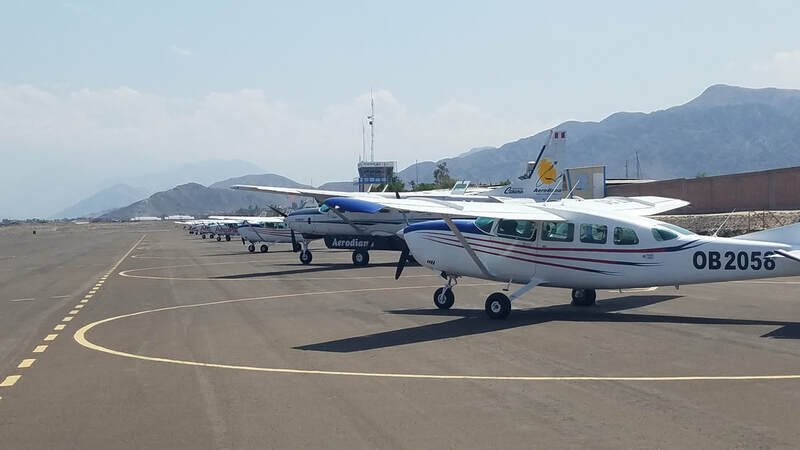 First evidence of the lines goes back to 1547 when Spanish conquistador, historian, and chronicler Pedro Cieza de León saw “signs.” His reference was forgotten until much later when they were rediscovered by the first Peruvian aviators of commercial airlines. 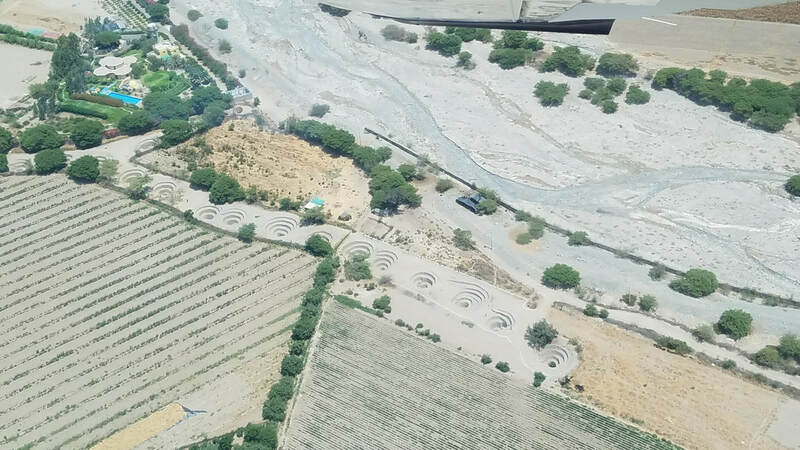 Out of all the famous Nazca designs, only three of them can be seen from a manmade tower along the long Panamerican Highway (Carretera Panamericana). The rest can only be seen by air. You may notice that the Lizard (approximately 144 x 528 ft for reference) is cut in half by the highway. The legend says the road was constructed before they knew those geoglyphs were there. My intention was to rent a C172/182 (with a local CFI) from one of the flight schools in the Lima area where I was staying; however, after making contact with them, I quickly learned that 1) a number of their aircraft were unavailable as they were being used for training purposes and 2) the ability to fly over the Lines requires government approval prior to launching. 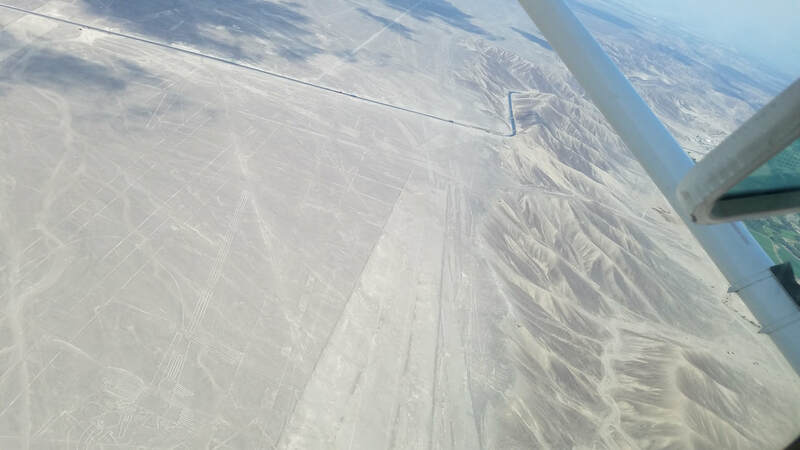 Restricted area R-70 goes from the surface to 12,000 feet MSL and encompasses the Nazca Lines. So, instead, they suggested going up with one of the outfitters giving air tours. Bummer! 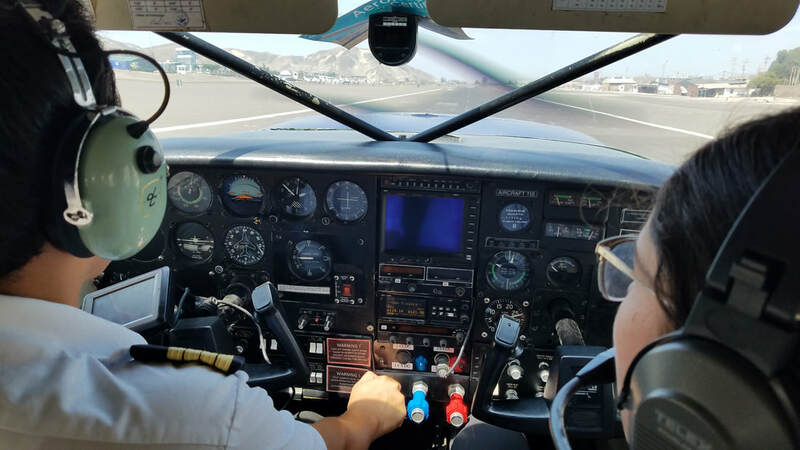 I was excited about flying myself (as I always do) and learning the local procedures but the goal here was seeing the Lines and going up with an air tour operator seemed like the only way to achieve it. A google search identified a variety of options both in aircraft type and airport of origin. 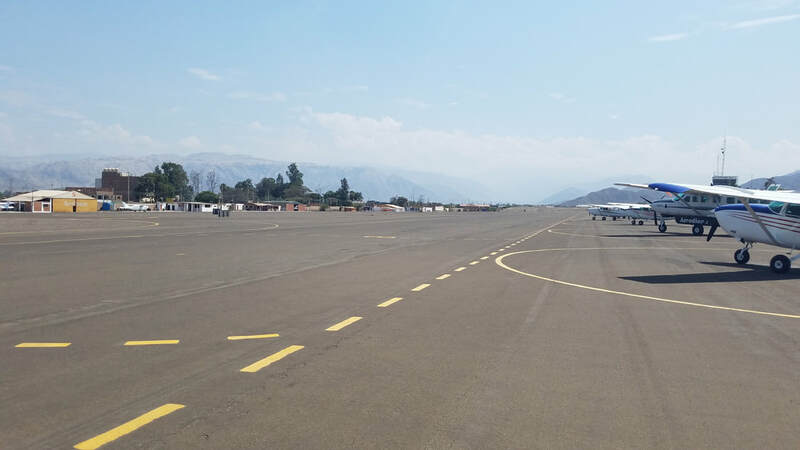 One can fly from Pisco, Ica, or Nazca itself. We ended up choosing “SPZA – Maria Reiche” as our launching airport for logistical reasons (other activities, schedules, availability, etc). The airport is named after Maria Reiche, a German archaeologist and translator, who studied the geoglyphs for many, many years. Her research concluded that the designs had an astronomical and calendrical purpose. AeroNasca (https://www.aeronasca.com/sobrevuelo-nazca-classic/) took us on about a 40 minute flight in a C207. I was looking forward to taking the right seat but, fortunately or unfortunately, they fly with two pilots. 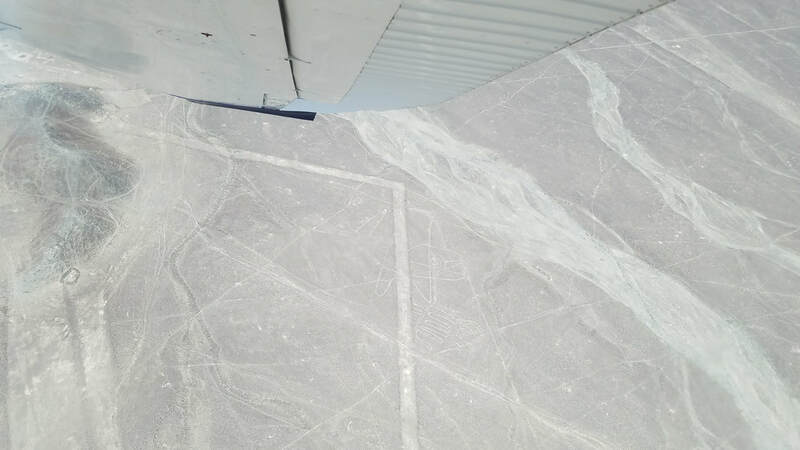 The elevation of the area where the drawings are is about 1,900 ft and we flew at 2,500-3,000 ft MSL. The flight was "not for the faint of hearth." The tight 30-45 degree turns turned some stomachs. The Nazca drawings/lines vary in size and detail. The route we took (shown below) included 13 drawings/lines; however, we spotted multiple others. Experts say there are upwards of 1,100 of them (between designs and lines) in the area. In fact, they’re still finding them. 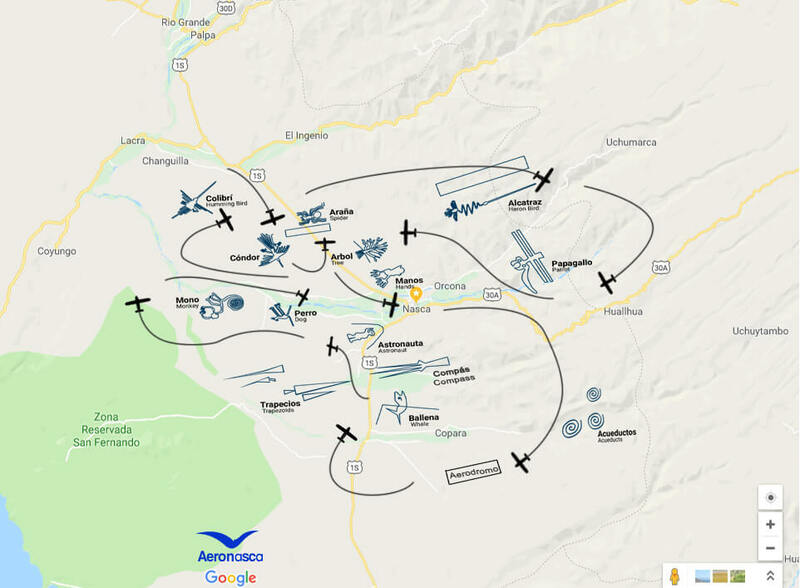 Source: AeroNasca and Google Maps. The whale is approximately 212 x 144 ft. The astronaut is probably one of the smallest figures (about 125 x 54 ft) but it’s on the side of a mountain. The monkey is 274 x 230 ft. The curiosity of this figure is that it shows the monkey with 9 fingers and with a tail in the form of a spiral. The hummingbird is 335 x 161 ft with a wingspan of approximately 217 ft. The condor is approximately 427 x 377 ft. The spider is one of the most obvious ones even though it’s only 172 x 155 ft. It is on the edge of a trapezoid on the Earth’s surface. The great egrett is one of the longest (907 x 181 ft). The parrot is approximately 719 x 317 ft and can be easily seen from the air as the pictures show. Its head is formed by segments of circles that have a radius that varies between 4 and 8 inches. What amazed me the most was the precision/symmetry of them, especially when you think of the era they were made in with no aerial vehicles, survey tools, technology, challenging terrain (flat with no shade), etc. I think that’s also where their mystery comes from and why some researchers believe aliens may have been involved. It’s fascinating to see how many different theories have been developed for “why” or “how” the designs were created. 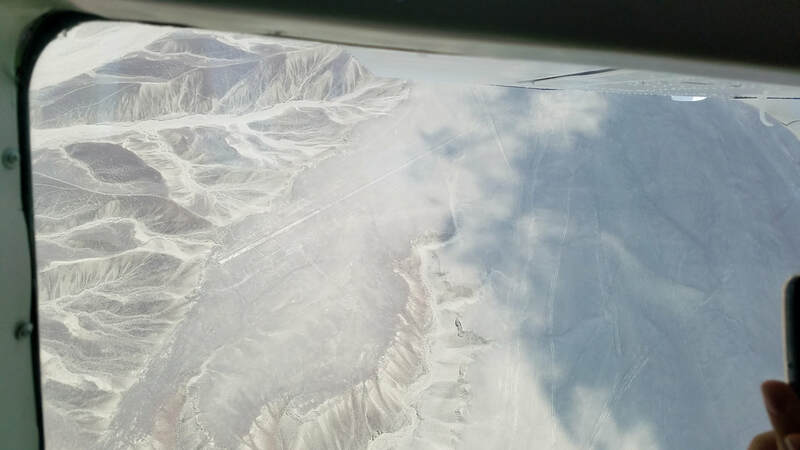 When you have some time, you should google Nazca Lines and read about them. On the way back to SPZA, to top it off, we saw Native American ruins and the Aqueducts of Cantalloc. Regardless of not being able to be PIC or even SIC, I loved the experience and highly recommend it to any of you planning a trip down to Perú. In addition to this flight, their food, Inca culture, and other area sites (Huacachina, Paracas, and Islas Balletas) amount to great reasons for scheduling a trip down under. I challenge you to tell me about other places where “flying over” is a must to appreciate its beauty. Fly safe and fly often!